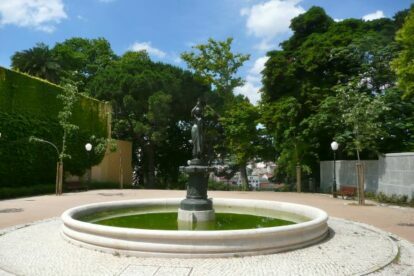 This is probably the most secret garden in Lisbon. Everyone in Lisbon knows it exists, has an idea where it is located, but most have never actually been there. The first time I entered it I felt like I’d entered a sacred garden, as beauty arises as you pass by the main entrance. The fountain, the Egyptian statue, the green walls, everything is perfect. The garden is located on a hill, gorgeously planted with trees and with the nicest seats a garden can possibly have. The seats are almost chaise longues, perfect for a morning load of vitamin E through sunbathing. I said morning because in afternoons the sun won’t be that helpful. The view from the garden is fantastic, as most views over Lisbon are. It’s divided in more lowered levels, one with a nice cafe, a children’s playground and another fountain. Although the garden is quite old, the 2000s restoration works gave it a new fresh air. Also, during summer, the bigger Fountain becomes a city beach. Another great sight you get are the surrounding XVIII and XIX charming mansions of the neighbourhood. There are two possible ways to get to the garden. One is getting the Lavra Lift (check the Lavra Lift article, which will get you almost to the garden’s main entrance. The other entrance is at “trua do telhal”, opposite number 49. Also a very discreet entrance, so pay a lot of attention. This is not the best garden, but surely the most lovely!